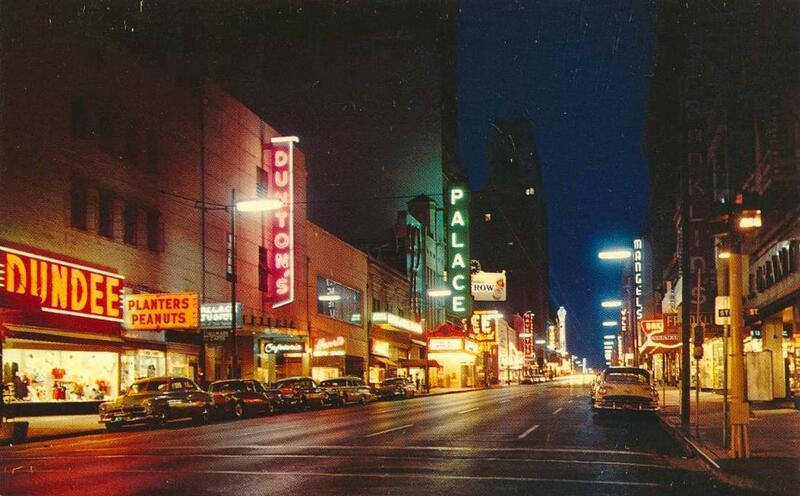 Two postcards from the Fabulous Fifties showing Dallas’ Theater Row, lit up at night — one looking east (above), and one looking west (below). Here’s Elm looking west, taken at about North Harwood. (See the same view today, here.) The movie playing at the Majestic, “The True Story of Jesse James,” was released in February, 1957. 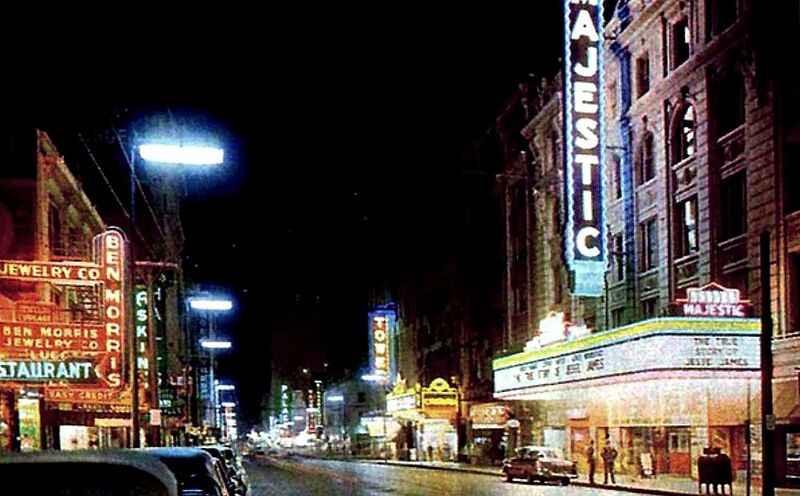 In all my wanderings through photos of old Dallas, my biggest regret is that I never experienced downtown-Dallas-movie-going in the 1930s, 1940s, and 1950s. Mr. Peanut, we hardly knew ye (or in my case, I never knew ye). The thought of buying warm, just-roasted nuts on the sidewalk of a busy downtown street makes me feel all nostalgic for something I’ve never actually experienced. It looks like the Planters Peanut shop was in a couple of different locations before it moved to the one seen above at 1607 Elm — first at 1519 Main (in about 1929), and then the 1500 block of Elm, next to Cullum & Boren (from 1931). Read a few memories of this Elm Street shop here; and see photos of a shop still operating in Memphis, here. Great night photos. So very familiar and full of memories. Shopped at several of the stores and of course went to all of the movie theaters. Thanks for posting these. Whenever my friends and I went downtown to see a movie, we always visited Planters Peanuts. It was a real treat. When we were about 10 years old we took the bus to downtown by ourselves on Saturdays.